PLEASE STOP USING THIS PRODUCT AND IMMEDIATELY CONTACT PREMIER KITCHEN PRODUCTS BY FILLING OUT THIS FORM FOR A $15 VISA GIFT CARD. THIS RECALL ONLY INVOLVES THE JULIENNE BLADE ATTACHMENT — YOU CAN CONTINUE TO USE THE LARGER SLICER ATTACHMENT AND THE FOOD CONTAINER AND KNOB/HANDLE. 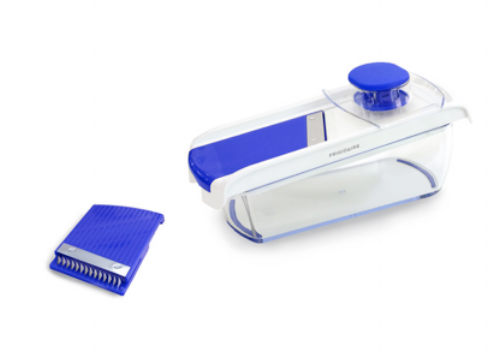 Hazard: The small blades in the julienne slicer attachment can separate from the plastic assembly and pose a risk of laceration to consumers. Consumers should immediately stop using the recalled slicers and contact Premier Kitchen Products for instructions on how to receive a refund in the form of a $15 Visa gift card. Consumer Contact: Premier Kitchen Products at 800-304-4035 from 9 a.m. to 5 p.m. ET Monday through Friday, email at recall@pkpny.com or fill out this form to receive a $15 Visa gift card. Description: This recall involves The Sharper Image™ and Frigidaire™ Mandoline slicers. The recalled slicers are a non-electric food preparation item used to slice and julienne vegetables. The slicers have a clear plastic container to capture the sliced food, two blade attachments (one large-blade slicer and one small-blade julienne slicer), a holder for the attachments, and a plastic knob component to move and hold the food. The model number and UPC code are printed on the packaging. “Frigidaire” is printed on the side of the Frigidaire slicers. Sold at: Beall’s Outlet, Christmas Tree Shops, dd’s Discounts, HomeGoods, HomeSense, Kohl’s, Macy’s Backstage, Marshall’s, National Stores/Fallas, Ross, Target and TJ Maxx stores nationwide and online from May 2017 through April 2018 for between $13 and $20.